This week’s picture was taken by ESO Photo Ambassador Babak Tafreshi at ESO’s La Silla Observatory. 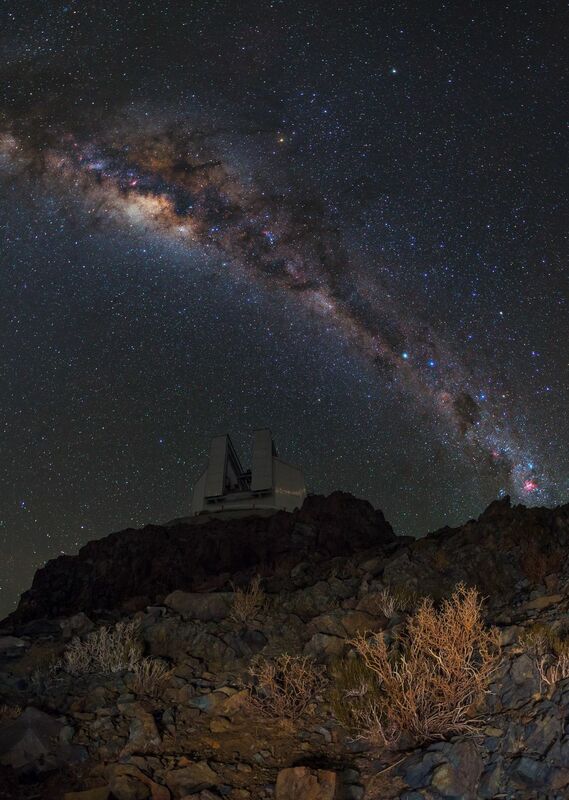 The bright lane of the Milky Way can be seen streaking across the skies above the Chilean Atacama Desert, beneath which sits the New Technology Telescope (NTT), one of the ten active telescopes located at the observatory. La Silla is the oldest observation site used by ESO — it has been an ESO stronghold since the 1960s. The site houses a number of telescopes, two of which are operated solely by ESO: the aforementioned NTT, the star of this image, and the 3.6-metre ESO telescope. Joining this duo are many other collaborative telescopes, operated by various ESO Member States — the Swiss 1.2-metre Leonhard Euler Telescope, the Rapid Eye Mount (REM) telescope, the TAROT gamma-ray-burst chaser, the planet-hunting TRAPPIST, the MPG/ESO 2.2-metre telescope, the ESO 1-metre Schmidt telescope, the ESO 1-metre, and the Danish 1.54-metre telescope.